OK, so if you follow me on Instagram you’ll have seen a sneaky preview of this project (along with a promise to get this post written last week, but, you know, life and stuff…) And here it is! 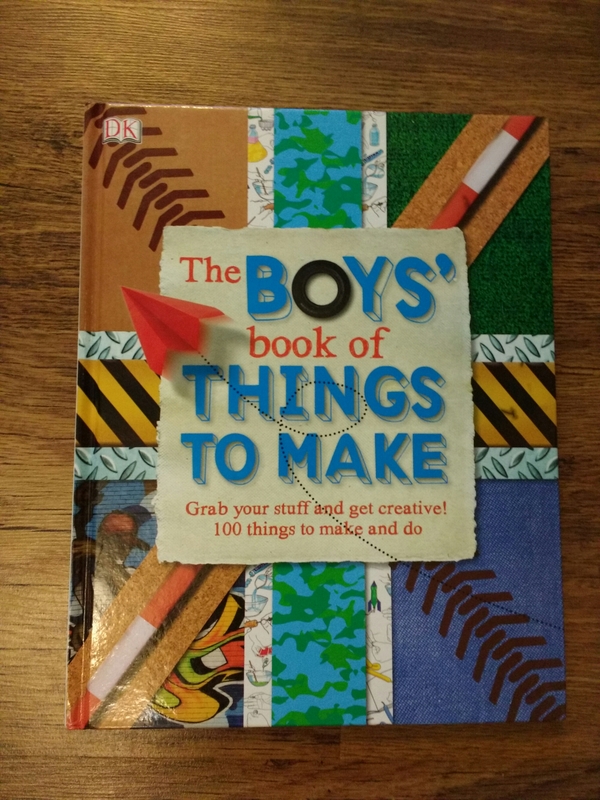 The idea for this actually came from an excellent book I bought big brother for Christmas, called “The Boys Book of Things To Make”. 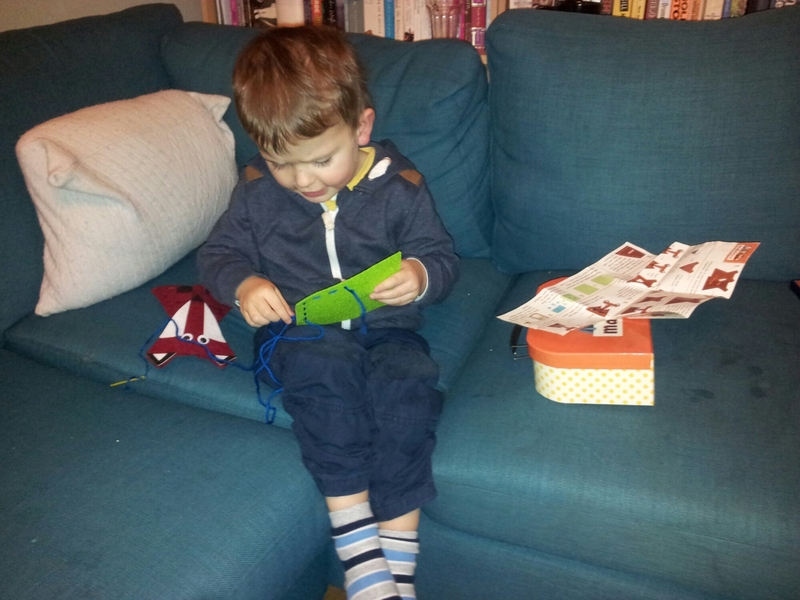 If you have a little boy I can highly recommend tracking down a copy of it, it’s fab! 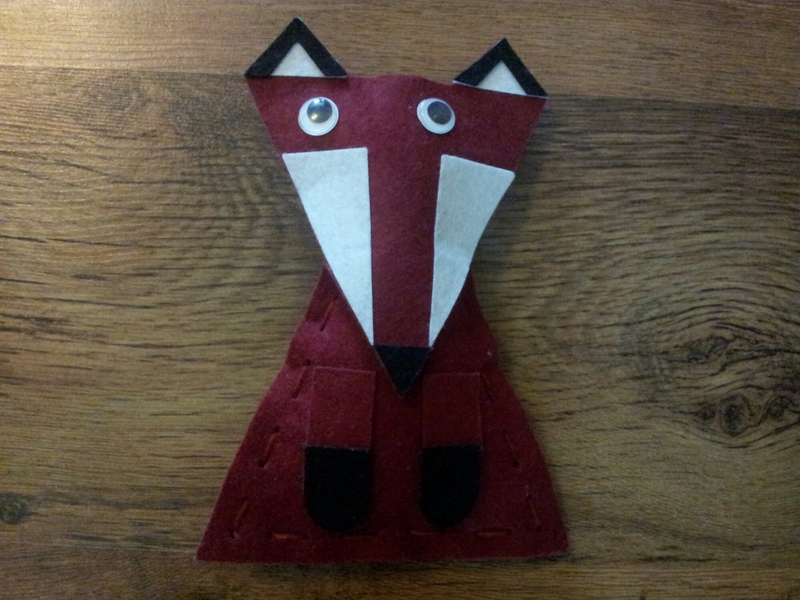 Full of fun craft projects and aimed at just the right level for kids to get involved with. Open the book and flip passed the first few pages, the idea being that it’ll look like a regular book to a casual observer (this is hilarious if you’re 3 apparently!). 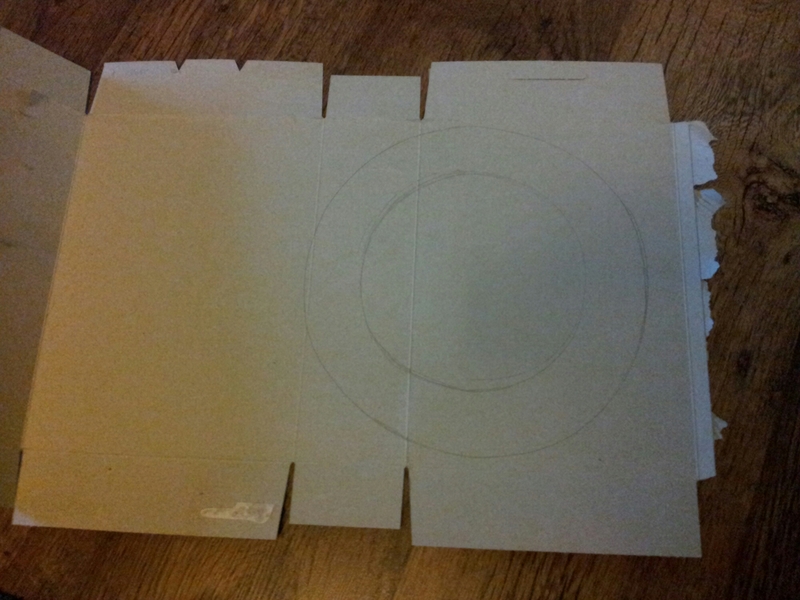 Then with the ruler and craft knife you need to start cutting out the centre of the remaining pages. As a rough guide the outside edge of the text area is an ideal line to follow. You don’t want to cut too close to the edge of the pages otherwise your book safe won’t be strong enough to hold anything without buckling. You won’t be able to cut through all the pages in one go, so find something heavy to weigh down the cut pages after you’ve turned them. This is the long part, especially if you’ve chosen a 600+ page book… 😉 So if you’re doing it with a little person, don’t be surprised if they lose interest a little at this point. Don’t worry if your craft knife slips a little while you’re cutting, as long as it isn’t on the first page you won’t be able to see it when you’re finished. 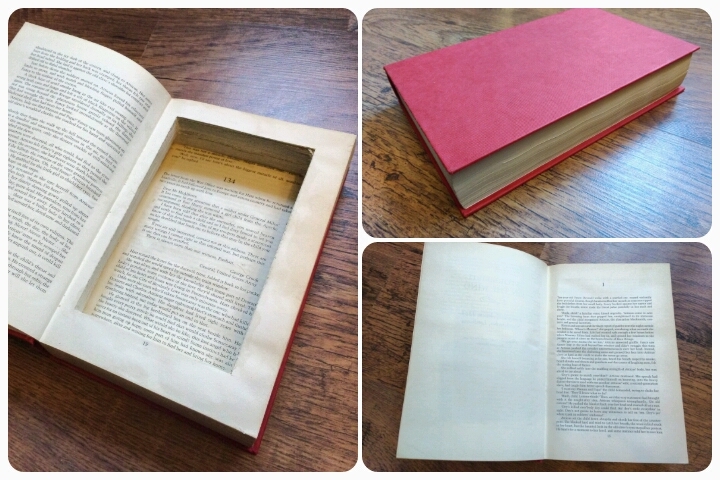 The final part of the project is to glue the cut pages together to create a solid box in which to hide your treasures. 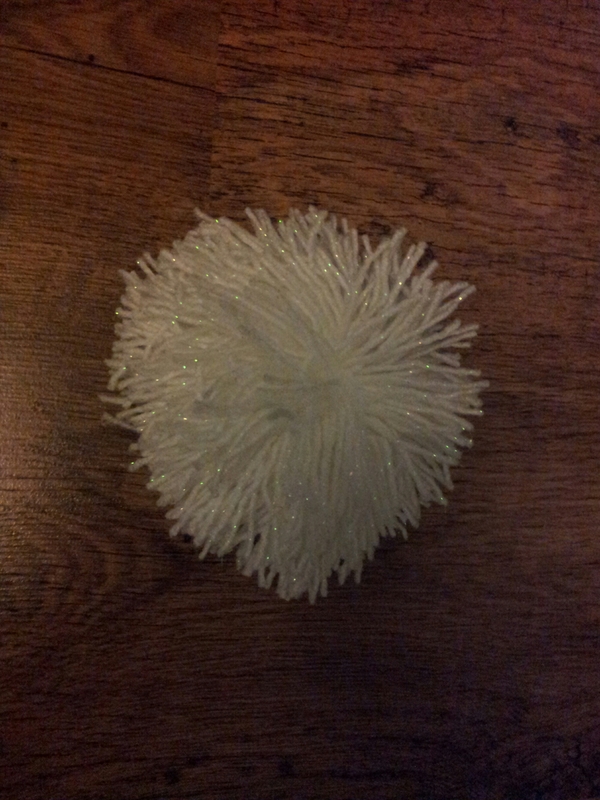 Pour a little of the PVA glue into a dish and water it down with slightly less than the same amount of water. 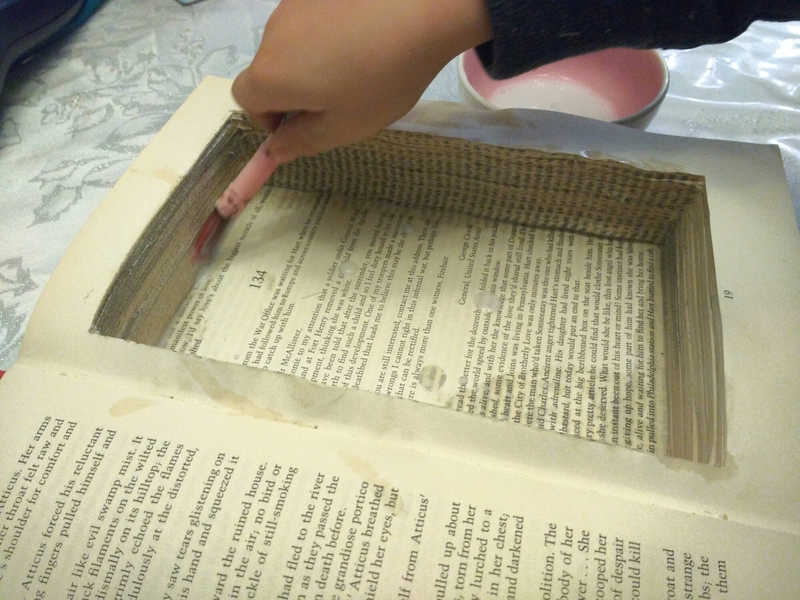 Mix until you have a thinned glue mixture and paint it liberally onto the insides and outsides of the cut pages of your book. 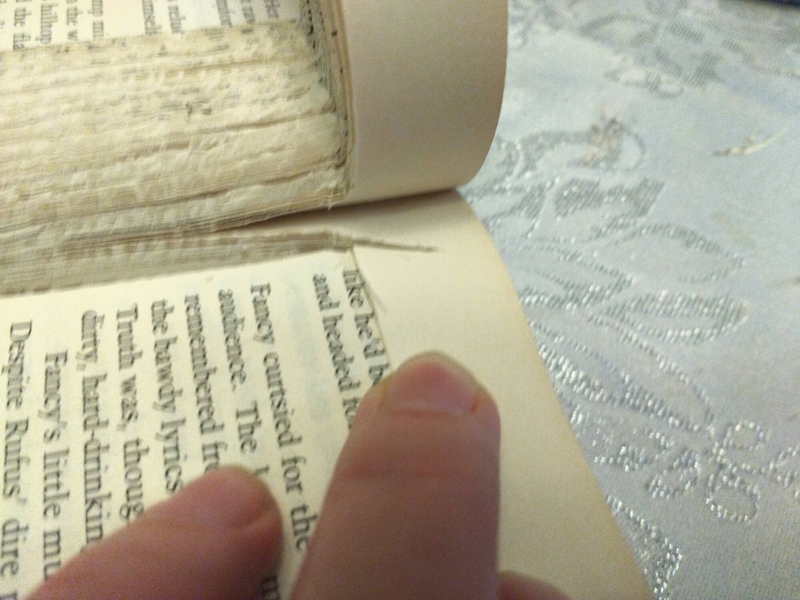 Place something non stick between the cut and glued pages and the first pages in the book (you don’t want them to stick together otherwise it defeats the purpose somewhat!). 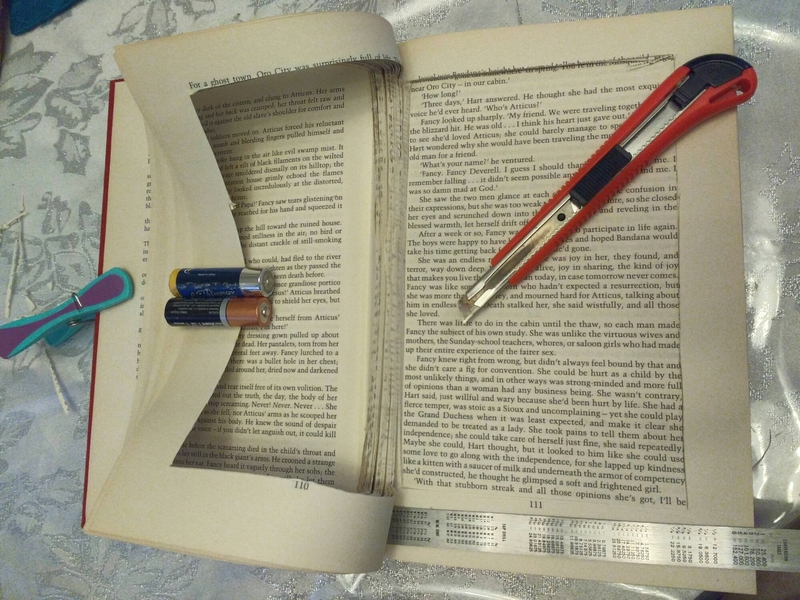 Close your book and weigh it down to dry, this will help the pages to stick. 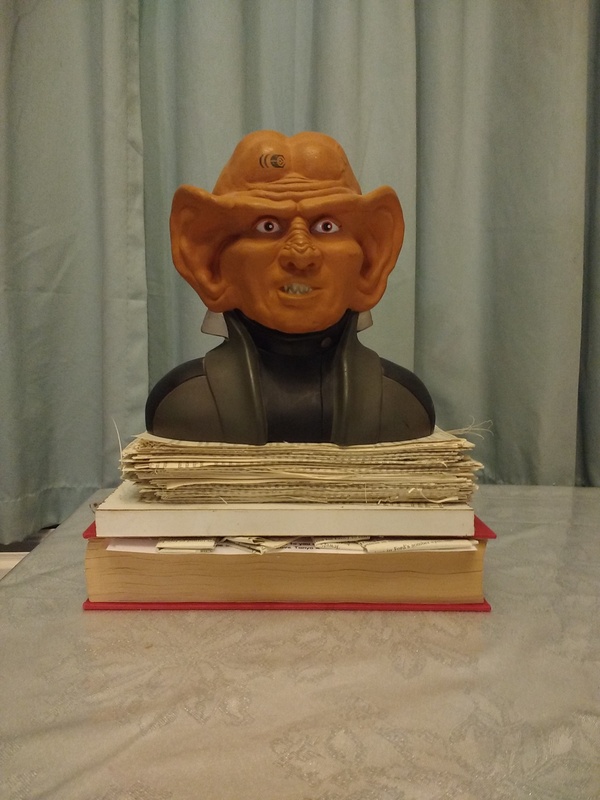 Meet our ferengi. He’s full of pennies so is nice and heavy for the job! 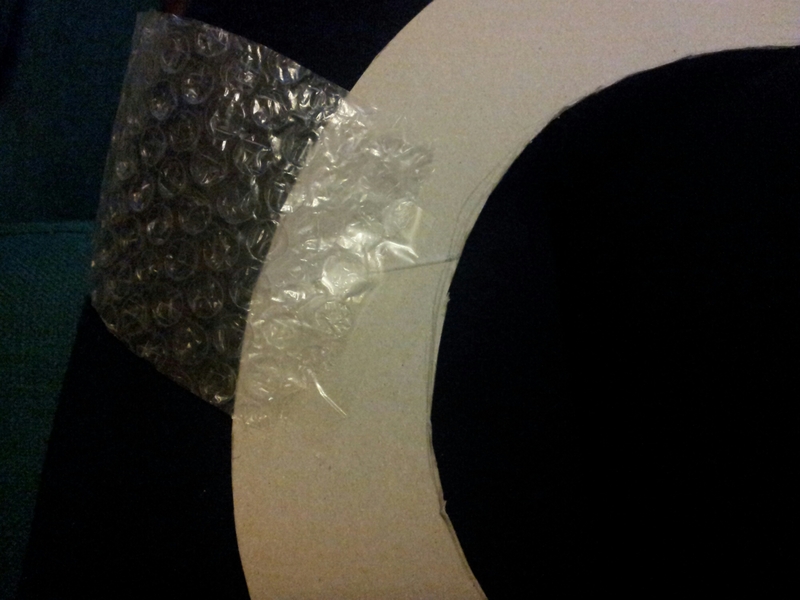 Leave overnight and repeat the gluing process if necessary. And now you have your very own secret hiding place! Hands up: who’s not ready for Christmas yet? Not just me I hope! 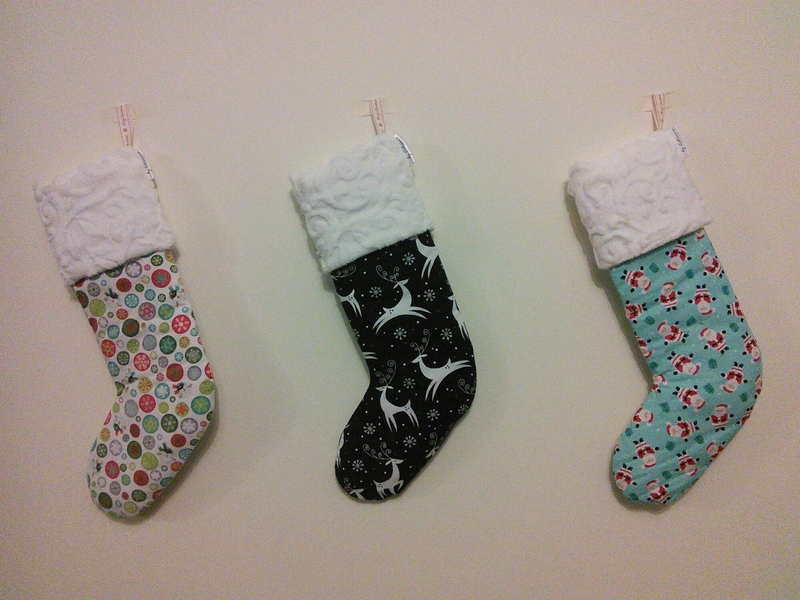 If you’re still looking for an easy little present or stocking filler, here’s a very simple idea that doesn’t take long to do. An idea of something to doodle! I would recommend using a proper porcelain pen and not just a marker, as it will mean your finished piece can safely be washed without your design coming off. 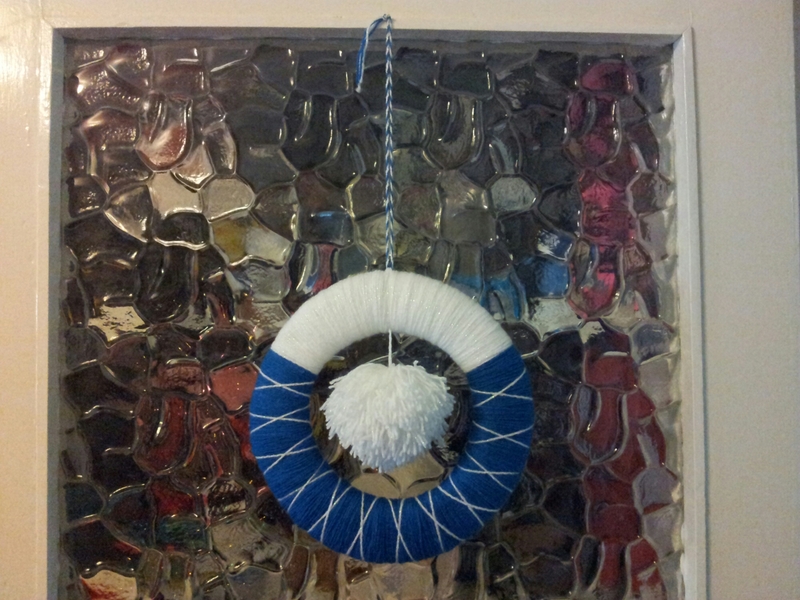 I bought mine at hobbycraft. 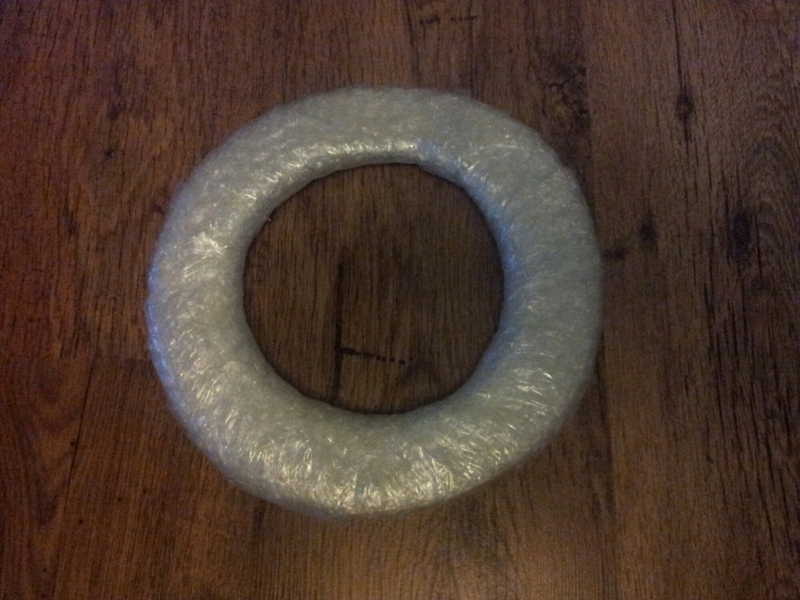 This one can (apparently, I’ve not tested it yet!) even be put through the dishwasher at up to 50°! Then comes the fun part: drawing on your design! 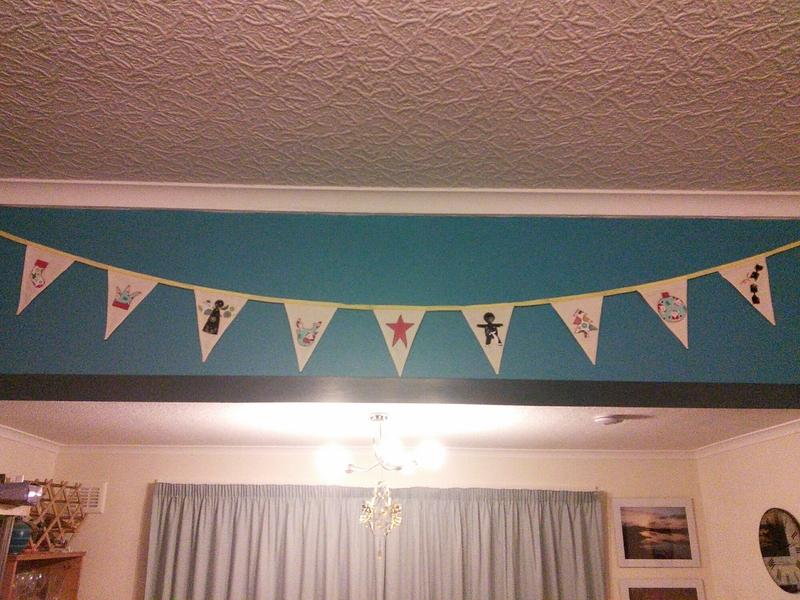 I’ve gone for simple repeating patterns to keep it easy to decorate, but you could go as complex or personalised as you like. For example: write a word, name or phrase; draw a more complex picture; a significant date or location. Really, you’re only limited by your imagination! Then just follow the instructions on your marker. I’ve got to leave mine to dry for 4 hours, bake for 30 minutes at 160° before leaving them to cool completely in the oven. 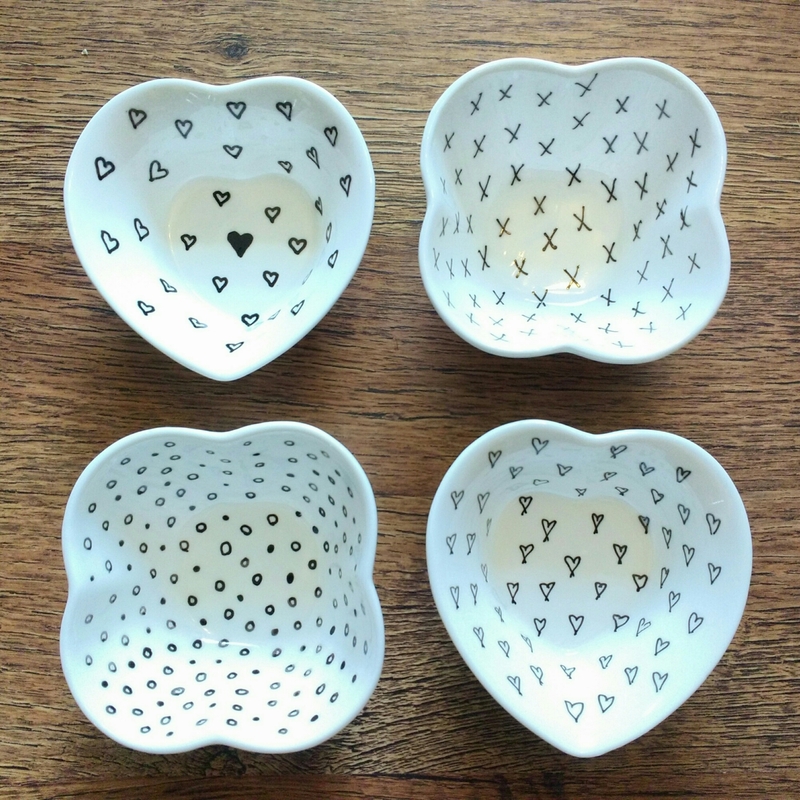 I’ve got some cups and saucers I’ve been meaning to decorate for myself for ages. Maybe once the Christmas craziness is over I’ll have a chance to do it! It can be tough to know what to dress babies in with the cold weather, especially as thick padded snow suits are not recommended for use in a car seat. And blankets shouldn’t go under the straps and when they are laid on top they can be kicked off. So how do you keep baby warm? Cut out a rectangle which measures at least 40 inches wide, by 30 inches high. If you want to get a little bit fancy you can round the corners like I did, but it makes absolutely no difference to the final thing! Then fold the blanket in half vertically to make a rectangle of 20 x 30 inches. Half way up the blanket, on the fold, cut a straight line in from the edge, through both layers, 1.5 inches long (so when the blanket is unfolded the hole is 3 inches wide). 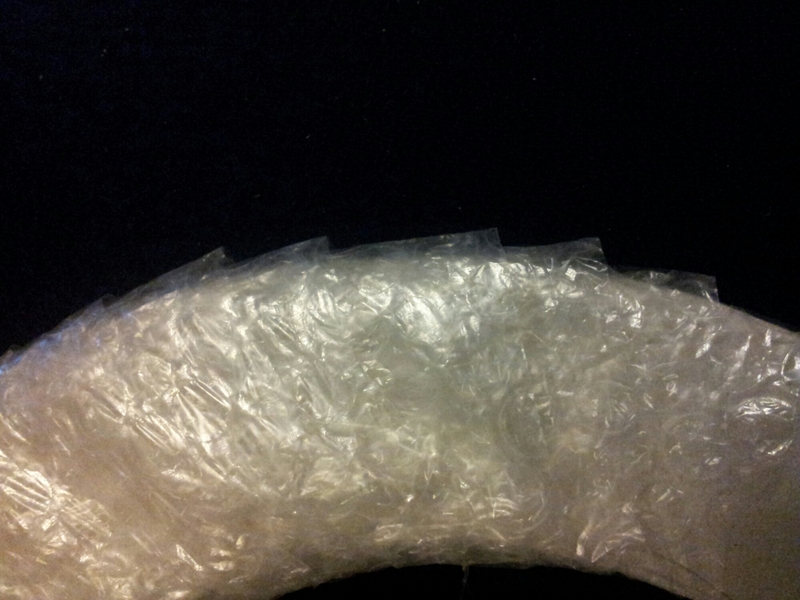 This is the hole for the clip part of the seatbelt to go through (does that bit have a proper name? Am I just having a major baby brain moment?!). 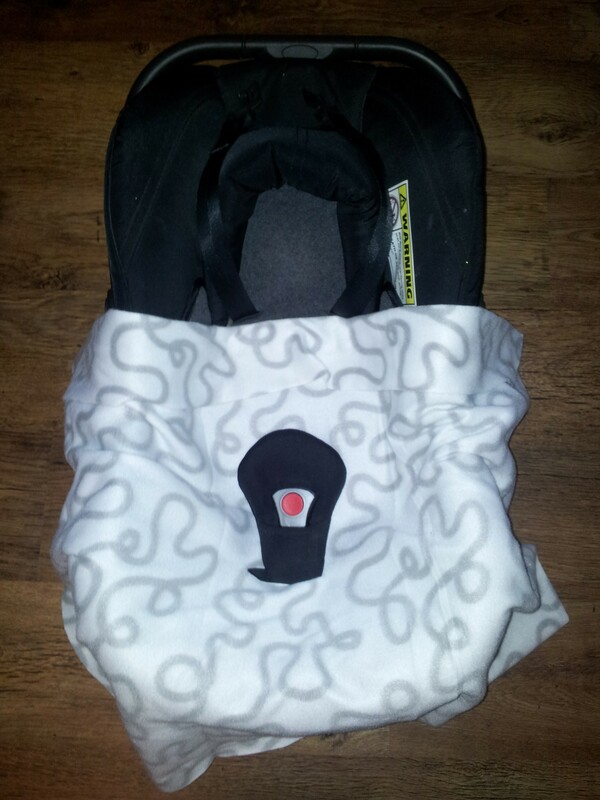 Feed the clippy bit through the hole on your baby’s car seat. You’ll probably find there’s a little fold over needed at the top edge of the blanket under the shoulder straps, but it leaves room to grow! Then find yourself an adorable baby and pop them in it! As you can see you strap them in before you cover them with the blanket. 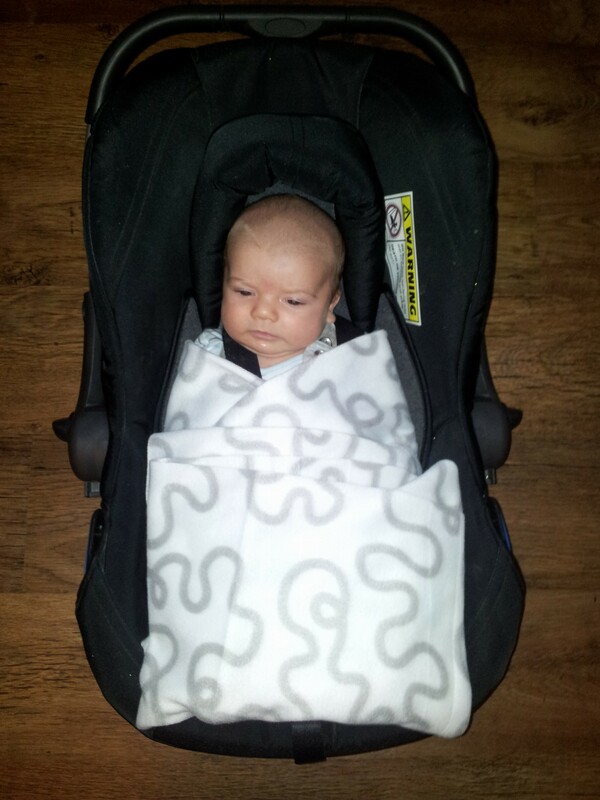 Then fold the blanket like an old fashioned swaddle, folding over the excess at the feet, and you’ll have one toasty little baby all ready to go! 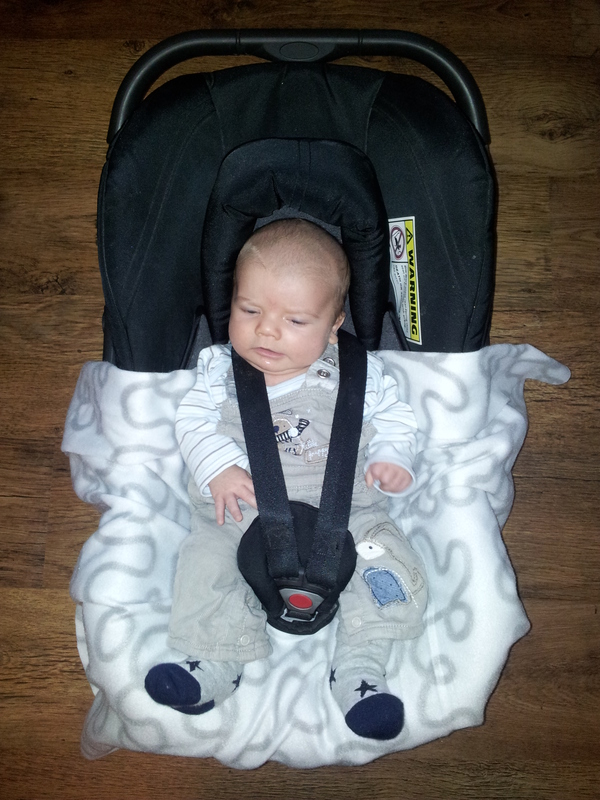 He is never that happy to go in his car seat when it’s actually going in the car… How can he tell the difference?!? Obviously when using a circular needle or double pointeds you can’t use a regular stitch counter as there’s not a needle end to put it on. But you might still need to count your rows, so what should you do? If your pattern repeats over a small number of rows as my current project does (4 in this case) then simply tie a slip knot in the tail left over from casting on each time you pass the tail. 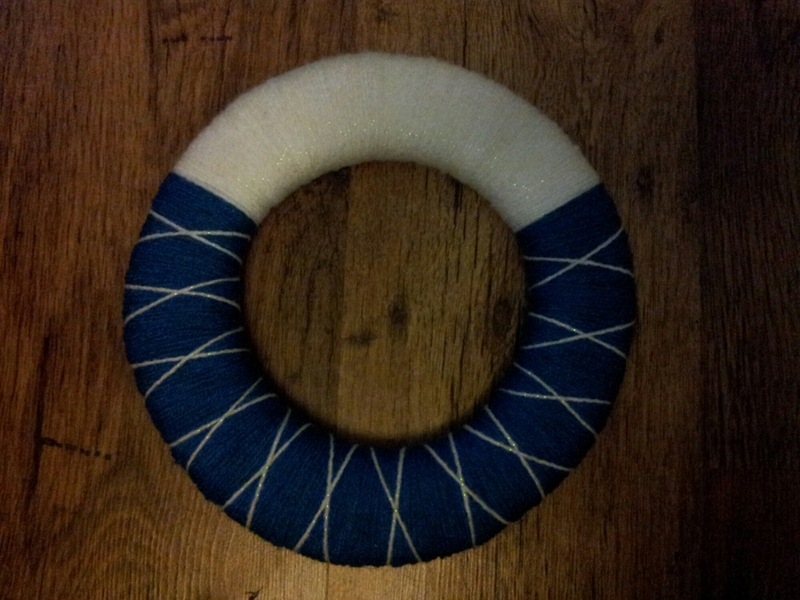 Then once you’ve completed the pattern simply untie the knots and start again. It’s a simple way to keep track and makes it much easier to leave your project and know exactly where you were when you come back. If you need to count a large number of rows I would thread a stitch counter onto the tail and loosely tie it to the work. Then every time you pass the tail you add another row on the counter. 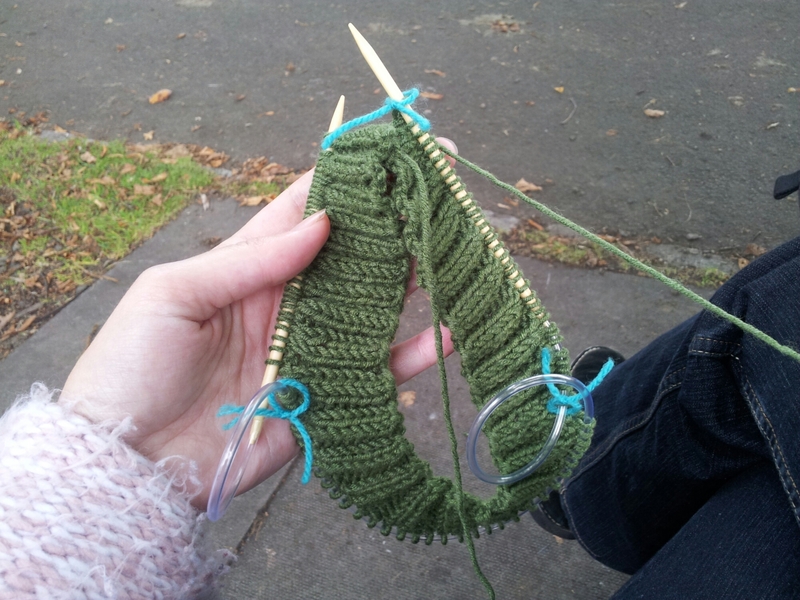 As I was knitting away in the park this afternoon, I thought it might be useful to pass on some tips I’ve picked up to make magic loop knitting a bit easier. 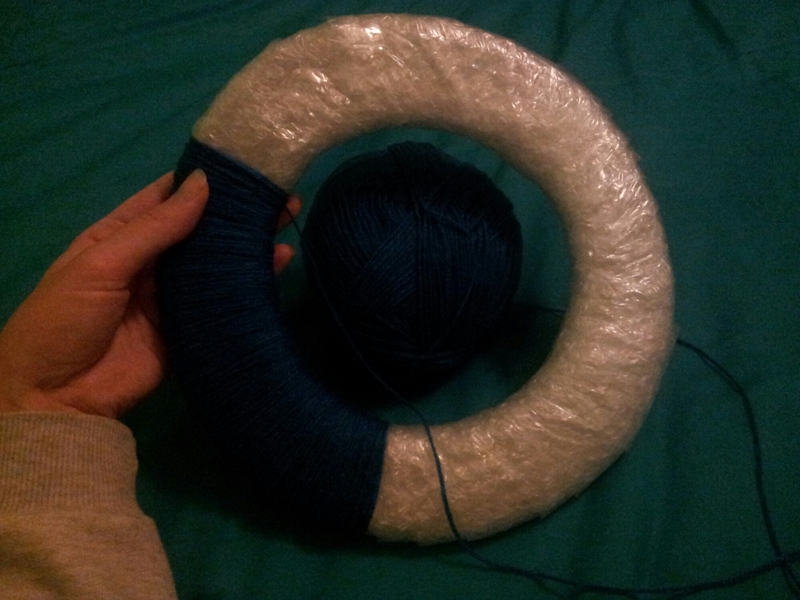 If you’re unfamiliar with it, magic loop is a technique to use a long circular needle for a project with a small circumference. 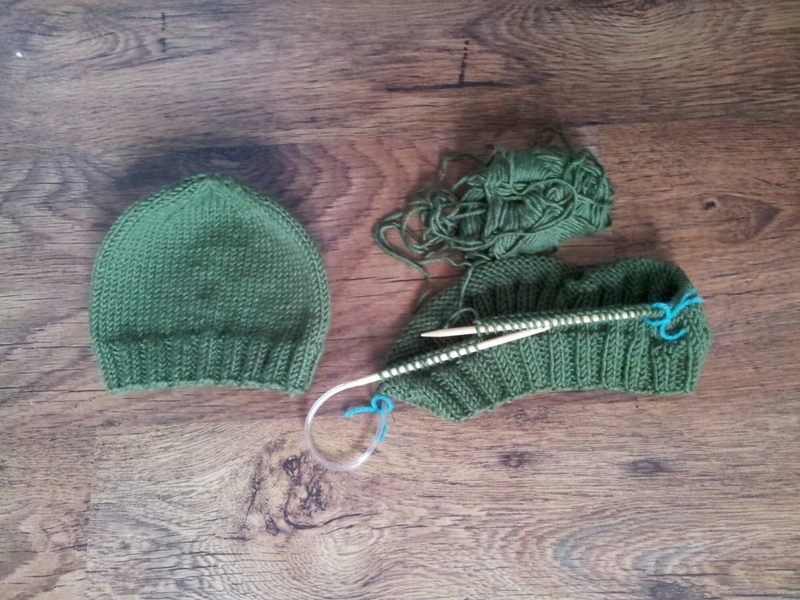 For example I’m using a 31 inch long needle to make baby and toddler hats. 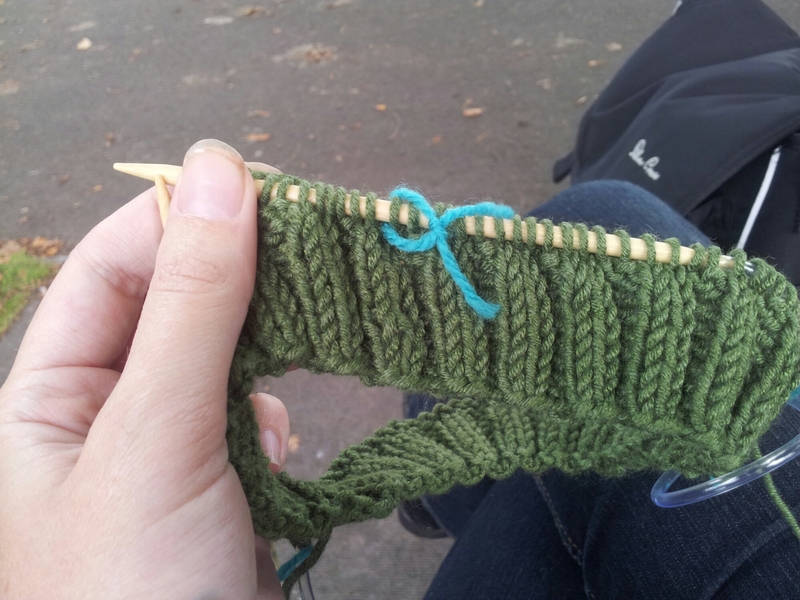 It is an alternative to using multiple double pointed needles. I’m not going to go through the whole technique as there are already plenty of good instructional videos on YouTube, these are just my tips to make it a bit easier. 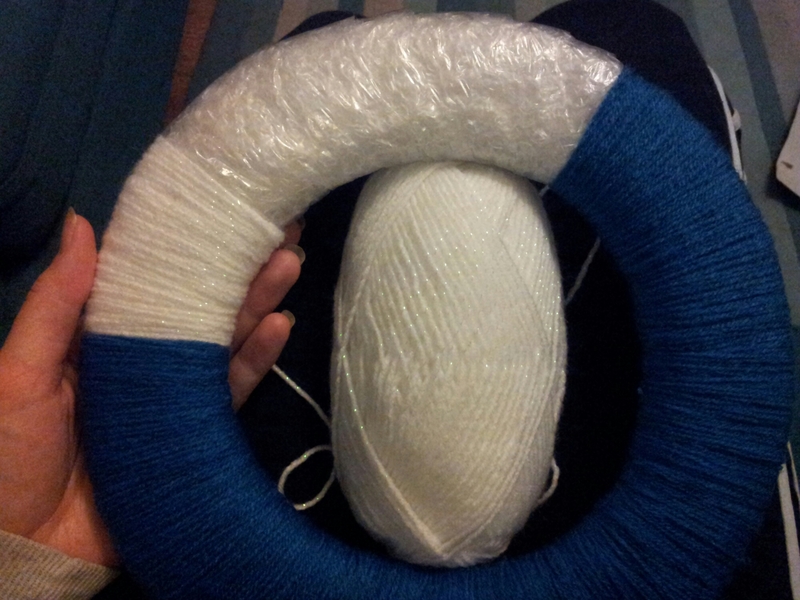 I’m making the basic baby hat from Mama’s Stitchery Projects. 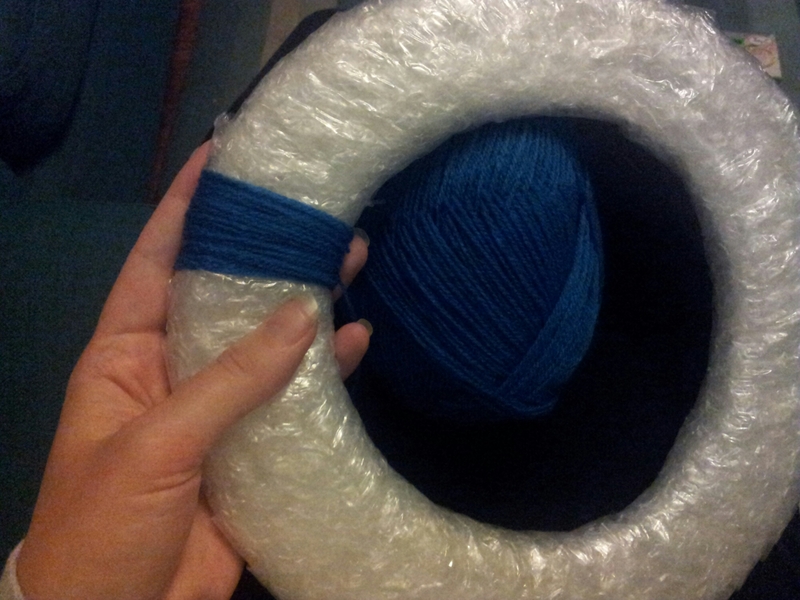 See the two loops and the stitch markers? This is what your work should look like each time you finish one section and before starting the next. 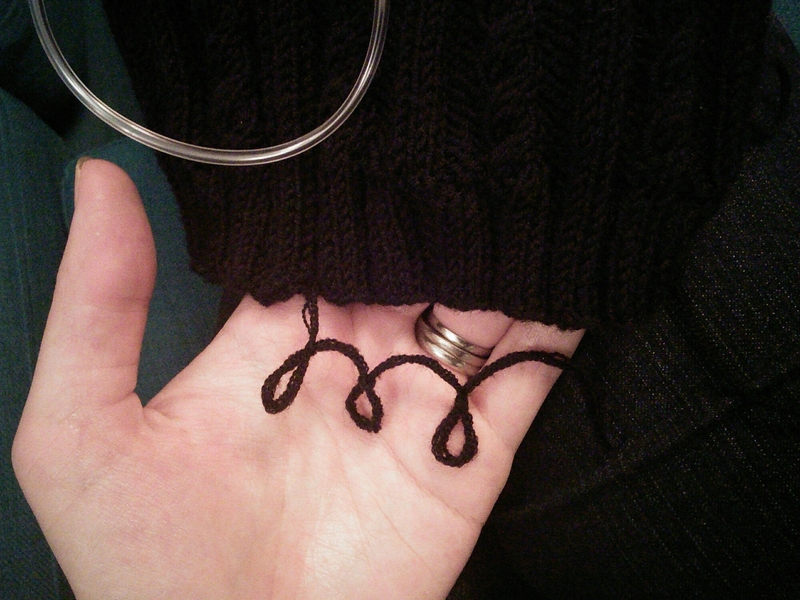 I know some videos say two sections is enough but I found that far too awkward, three gave me much more freedom of movement with the needles. 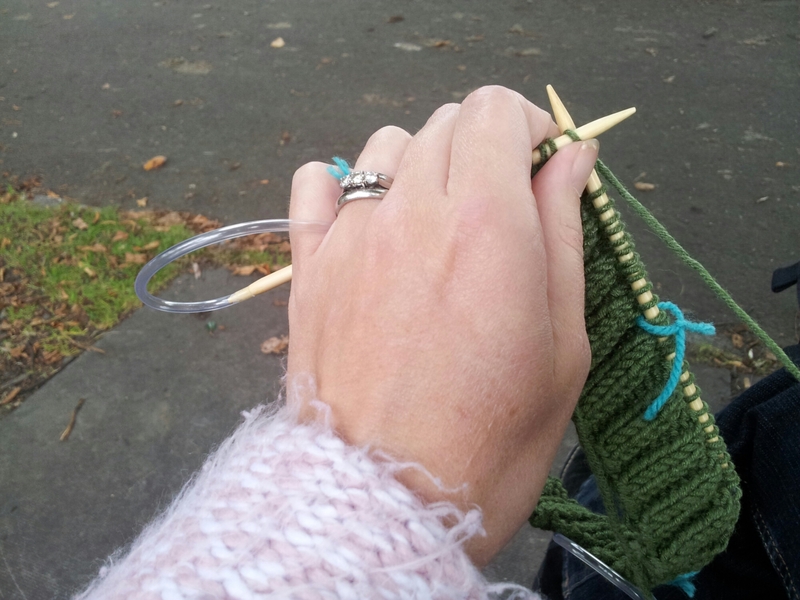 Otherwise I feel like my fingers are getting in the way, and it stretches the last few stitches too much. 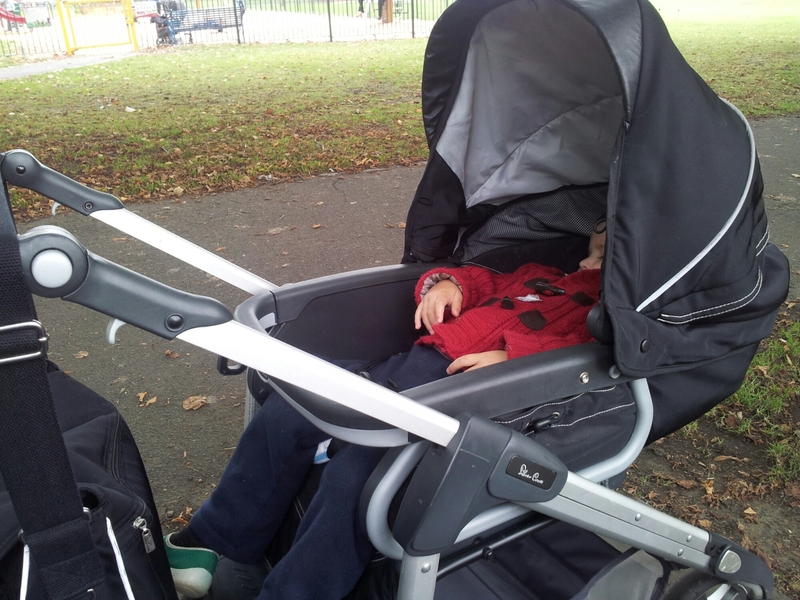 Oh, and if you’re concerned I was being neglectful and ignoring young sir at the park, fear not. He got too excited at the prospect of going to play and fell asleep en route! Oh well!